I greatly enjoyed a lovely morning here in Santa Barbara today presenting to the Cate school faculty on a topic of their choosing, touring the 21st century learning landscape with an emphasis on the skills, competencies, habits and attitudes which are most being emphasized in learning today. After an entertaining launch to our morning with the Marshmallow Challenge, we discussed the importance of collaboration and iteration in the 21st century learning, with a suggestion that PBL is the best way to support these elements. Keying off of the TED talk about the Marshmallow Challenge, we also asked the question how we help our students act more like Kindergartners– prototyping and iterating– than MBA students, searching for the one perfect solution. 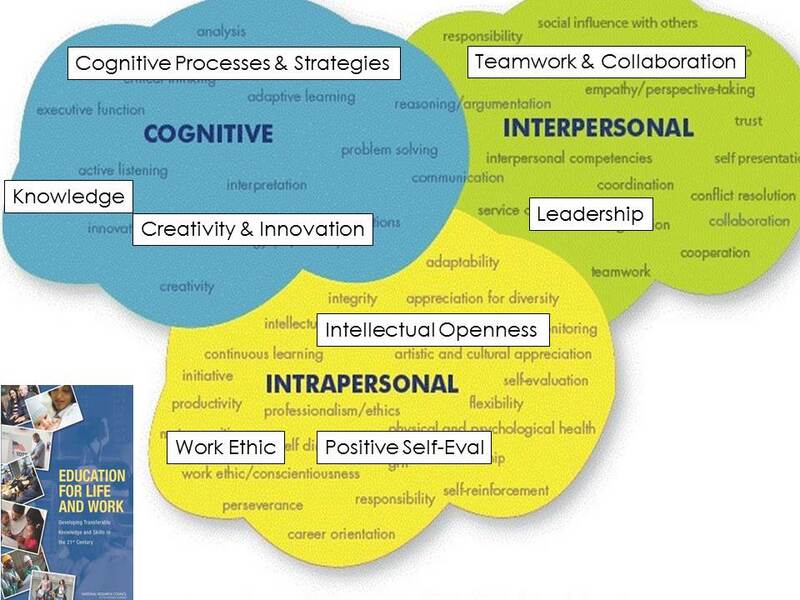 That work features a tripartite construct, comprehensively communicating what we need to support the learning and development of the cognitive, intrapersonal, and interpersonal qualities in each student. Below is the graphic with the key two or three elements the report emphasizes for each of the three major categories. Onto the tripartite structure I mapped the Cate’s 5 Educational Principles– Knowledge, Communication, Curiosity, Determination and Compassion– and my “top ten” list of key 21st century skills and habits of mind and character: the 4 Cs; play, iteration, and experimentation; 2 essential intrapersonal elements, grit and the growth mindset; and the four critical components of the internet era: connected learning, attention and self-regulation, information literacy, and positive digital citizenship. You can see this all mapped out in the overly crowded slide (!) below, with Cate’s 5 elements in red, my set in black, set atop the NRC tripartite bubbles. Each of these areas we explored in varying depth, taking an extended pause in which participants were provided and actually asked to undertake/solve and discuss four pertinent self-assessment and test questions: Duckworth’s grit survey, a Growth mindset survey; a sample CWRA question; and sample PISA questions. Below are the videos we used in the program. My thanks go to everyone at Cate, including my main contact Jay Dorion, Assistant Headmaster, and Ben Williams IV, Headmaster of Cate.